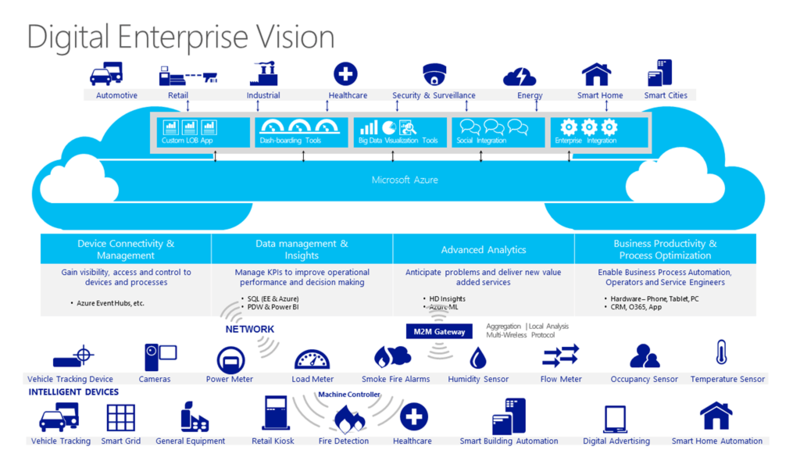 Microsoft Azure IoT Suite Provisioned solutions will help you create your own fully integrated solutions tailored for your specific needs in the following 3 sections. Using these ready to consume solutions will accelerate your time to market IoT(Internet of Things) requirements. Remote Monitoring – Connect and monitor your devices to analyze untapped data and improve business outcomes by automating processes. For ex: As a car manufacturing company, provide an option to customer to remotely monitor their car condition, and suggest if they need a re-fuel or oil change. Connected Factory – Anticipate maintenance needs and avoid unscheduled downtime by connecting and monitoring your devices. For ex: As a car manufacturing factory and spare parts are essential for car manufacturing. Automated solutions can ensure timely availability of necessary spare parts inventory to meet daily, weekly or monthly manufacturing needs. Predictive Maintenance – Connect and monitor your factory industrial devices for insights using OPC UA to drive operational productivity. For ex: As a car service support, you can get near real-time performance data from the cars manufactured by your company, predict the health of each components in a car and offer timely maintenance to their cars. Send real-time reminders and notifications to customers. Their by ensuring higher satisfaction levels for customers and more business value to the organization as it attracts more sales and good customer feedback. Connect and scale quickly – Use preconfigured solutions, and accelerate the development of your Internet of Things (IoT) solution. Analyze and process data – Collect previously untapped data from devices and sensors, and use built-in capabilities to visualize—and act on—that data. Integration and Digital Transformation – Easily integrate with your systems and applications, including Salesforce, SAP, Oracle Database, and Microsoft Dynamics, making it simple to access your data and keep your disparate systems up to date. Enhanced security – Set up individual identities and credentials for each of your connected devices—and help retain the confidentiality of both cloud-to-device and device-to-cloud messages.